The goal is to populate an electronic food safety system with valid governance that is aligned with all of the requirements in a food operation (food code, best practices, industry standards, etc). 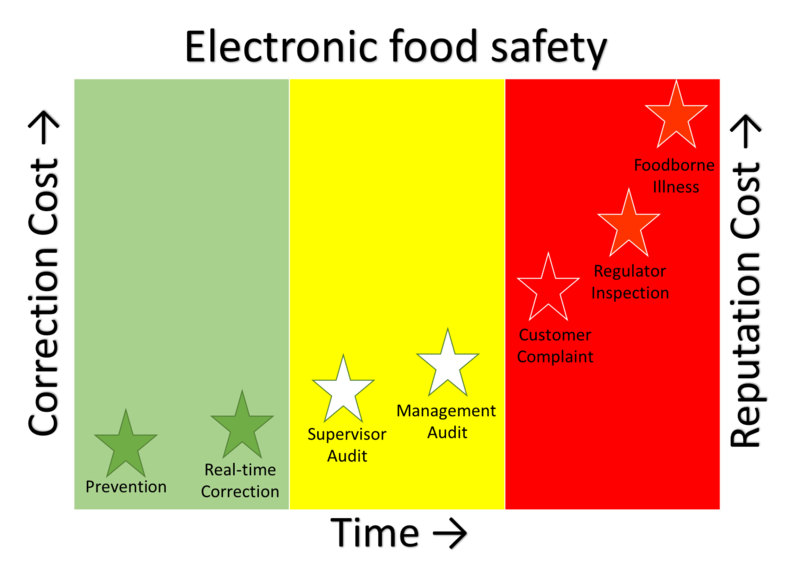 The electronic food safety system enables both prevention and real time correction of problems. Corrections at this level are very low cost. Prevention is modulated by monitoring tools and people (facility, sanitation, hygiene). Real time correction is then used to catch in-process deviations. Supervisory and management audits add another layer of compliance verification. Time has passed and the cost of correcting deviations is greater. Finally, product is in commerce and subject to consumers. Their complaints can easily be monitored and corrected. Bad press, bad food, and bad public relations are all very costly. The last layer of auditing is the regulatory inspection. Deviations should not reach this level. Rapid corrections must mitigate concerns. Finally, the most at-risk and uncorrected deviation could lead to food borne illness. Should that ever occur, an electronic food safety system can enable trace-back and process analysis.